How do you ruin one of the most successful and beloved game franchises of the 21st century? I mean, besides coding it so poorly it crashes constantly? And adding a main character who unceasingly sends you across the map to shoot zombies, distracting you from finding your kidnapped son? And adding a side-game of building shacks out of trash and desk fans, which only results in more people asking you to shoot zombies? 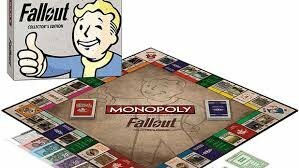 Well, I guess there’s also Monopoly: Fallout, a Fallout-themed version of Monopoly. 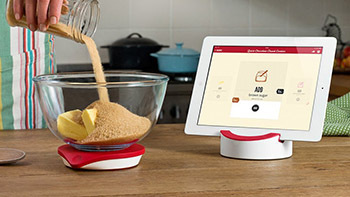 The Drop Kitchen Scale connects to your iPad via Bluetooth and tells you, step-by-step, how to bake a specific baked good. You know, like a cookbook, or a recipe site, except it costs ninety dollars. And it doesn’t have a readout on the scale itself, so you can’t use it like a normal kitchen scale ($12) without propping your ipad up next to it. But it does have a feature to allow you to take pictures of your food after you’ve cooked it, and share it with other Drop users. There’s a similar product called Perfect Drink Smart Bartending that’s the same idea, except for people who can’t handle pouring two liquids into the same glass.